Alkemor’s tower is another visually strong machine from BetSoft. It’s a game about wizards and the attention to detail is simply spell bounding. The title has absolutely loads of special features, and a modern feel with loads of replay value. The main game prizes might be a little low but with all the bonus rounds on offer, this one’s still capable of conjuring up some big wins. Great theme and style. The artwork is typically strong being a BetSoft game. Fantastic and varied bonus features that are relevant to the theme. Rather low main game prizes. We’re used to seeing four and five figure jackpots on games. Alkemor’s Tower doesn’t get close to these base game winning combination prizes. Typically-low upper betting limit. 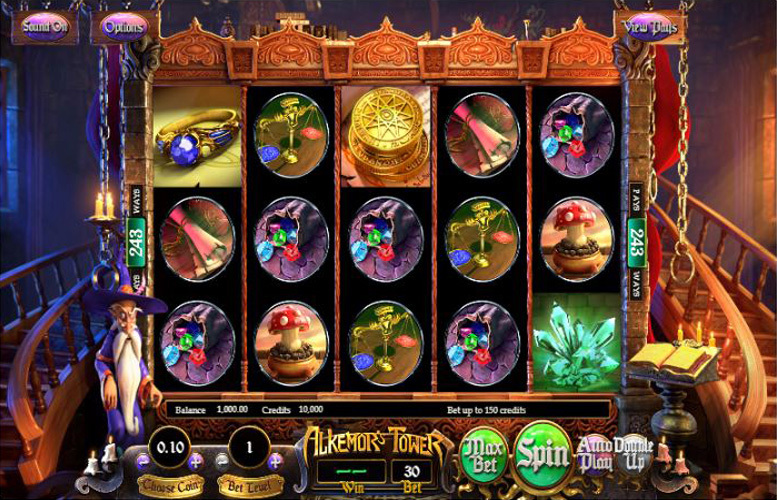 As is the case with many BetSoft games, Alkemor’s Tower doesn’t cater for the highest rollers around. Wizard = 350x the line bet. Green crystals = 200x the line bet. Coins = 150x the line bet. Ring = 100x the line bet. The elemental symbols are represented by bottles of potions. Each is triggered by combining Spell Books on reels one and two with an elemental symbol on reel three. Each different potion triggers a different spell. Spell books landing on reels four or reels four and five will increase the power of the spell. Players should also note that only one elemental feature can be triggered per spin. When an elemental spell combination occurs with a blue water spell symbol, the “Water Spell” will be cast. A tremendous wave of water will be summoned by the wizard, splashing across the game screen. This causes all elemental and spell book symbols on reels two, three, four and five to become “wild”. The spell book symbol on reel one will be transformed into a payable symbol. 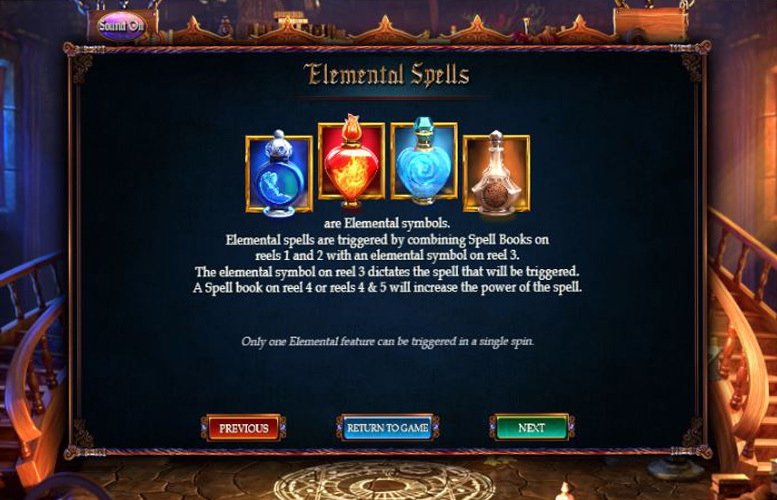 Following this, wins are recalculated, and multiplied by the number of spell book and elemental symbols that triggered the feature. When an elemental spell combination occurs with the brown earth potion on the third reel, the “Earth Spell” will be cast. This causes the ground to shake and Alkemor summons meteors which rain down onto the reels. All spell book and elemental symbols on reels two, three, four, and five will become “wild”, and all other icons are destroyed and a cascade of new symbols fall to replace them. Following this, wins are recalculated. The new symbols cannot retrigger the feature, however. When an elemental spell combination occurs with the blue air potion on the third reel, the “Air Spell” will be cast. This causes the wizard to summon a huge tornado. The tornado will cause all spell book and elemental symbols on reels two, three, four, and five to become “wild” and all other symbols to fly off the reels and return in brand new positions on the screen. The spell book symbol on reel one will be transformed into a random payable symbol during the tornado too. Wins are then recalculated. When an elemental spell combination occurs with the red fire potion on the third reel, the “Fire Spell” will be cast. The great wizard Alkemor will summon a huge ball of fire, aiming it down at the reels. The reels erupt in flames, causing all spell book and elemental symbols on reels two, three, four and five to burn into special “wild” symbols. The spell book symbol on reel one will be transformed to a random payable symbol. Extra “wild” symbols will also be added, equal to the number of spell books in the triggering spin. Following this, wins will be recalculated. Combine the two blue book symbols and the book wrapped in vines as a winning combination and players will be transported deep into Alkemor’s mysterious “Nature Floor”. Venus fly trap = 80x the line bet. Pink starfish flower = 60x the line bet. Orange flowers = 40x the line bet. Blue creature = 20x the line bet. Landing the vine symbol anywhere on the third reel and it will devour its neighbours, with rewards for each symbol it eats. Combining two blue books with the book and star symbol causes players to be transported to the top of Alkemor’s Tower, the Celestial Floor. 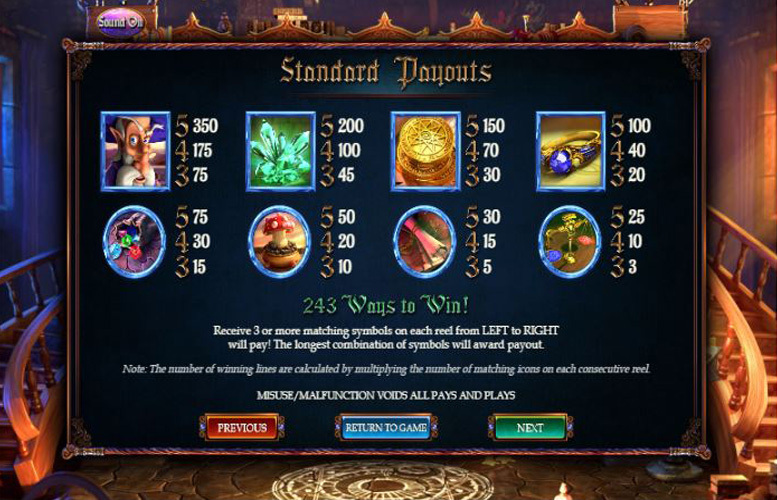 There, players can earn 10,12, or 15 bonus spins, depending on the number of elemental symbols landed. Sun = 80x the line bet. Red nebula = 60x the line bet. Galaxy = 40x the line bet. Planet – 20x the line bet. Land a black hole symbol anywhere on reels two or four and it will devour its neighbours with rewards for every symbol consumed. 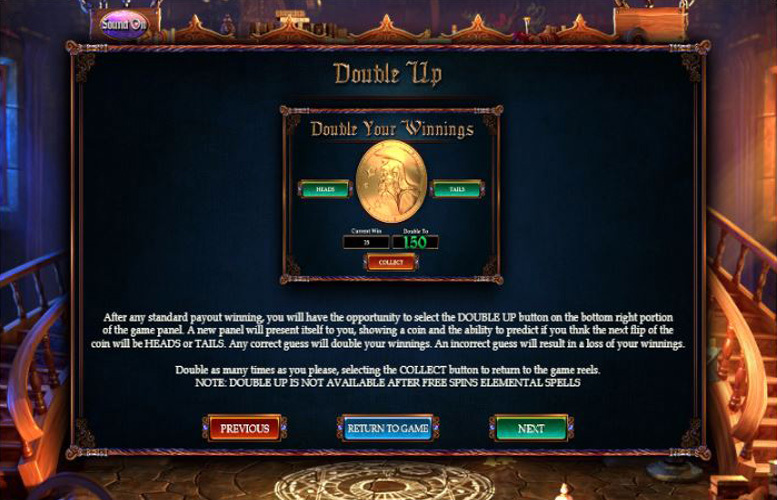 After any standard pay-out winning, players are given the opportunity to select the “Double Up” button on the bottom right on the game screen. A new panel will open, showing a coin and options to choose heads or tails. If players guess correctly, their winnings are doubled and they’re given another chance to gamble. If they’re wrong, they are taken back to the game and forfeit any winnings. There’s no limit on the number of times a player can successfully double their winnings. Pressing “collect” at any time will also return to the game reels. Bag of gems = 75x the line bet. Mushroom = 50x the line et. Scroll = 30x the line bet. Scales = 25x the line bet. Being a 243 “ways to win” machine, there are no specific win lines in play. This means players can only adjust the value of each coin, and the “level bet”. There are between one and five levels to choose from and each coin can be worth from 2p to £1. With all values set to the minimum, the lowest cost per spin is 60p, and the highest is £150. Whilst this will be enough to satisfy most players, the highest rollers might find it needlessly limiting. Alkemor’s Tower is a great machine that’s heavy on atmosphere as well as special features. The music, artwork, relevant bonuses and animation combine to make a game that has amazing replay value as well as a strong character. Despite a few negatives, it’s well worth a play. This game has a rating of 5 / 5 with 597 total reviews by the users.